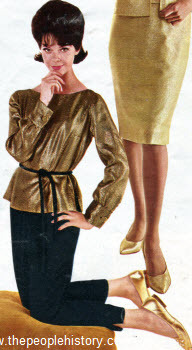 Fashion Clothing From the year 1962 including prices, descriptions and pictures for Ladies and Gentlemens outfits, shirts, dresses etc. Description A perfect blend of color and line creates a new modern pajama tops and pants. Solid color back. Colors combinations include red, blue, yellow and white top with red pants or lime, orange, gold and white top with lime pants. Description Striped multicolor reversa-shirt boasts cowl collar on one side, fish-tail collar on the other. Combed cotton knit. Pedal pushers come in lime, blue or beige. Description Imported Italian fabric in a soft, muted plaid. It's made with ninety-five percent reprocessed wool and five percent other fibers, laminated to polyurethane foam for lightweight warmth, then fully lined with rayon. Note the continental shoulder treatment, detachable back-belt and split-raglan sleeves. Comes in olive green or brown. Description A filigree of diamond-patterned lace has you looking glamorous. Dress has a v-dip in front and back. Take note of the very flared, slightly saucy, zig-zag hemline. 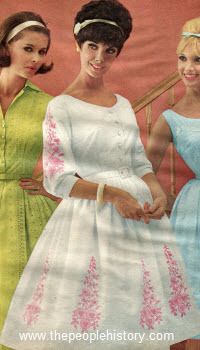 Cotton lace; full lining and contour belt of acetate taffeta. Back zipper. Black over white. Description Big embroidered bouquets bloom high, wide and handsome on this fetchingly feminine dress. Designed with scoop neckline, gently fitted bodice accented with tiny fabric buttons, below-elbow sleeves, skirt of unpressed pleats. Step-in style. Combed cotton broadcloth. White with pink. Description Lounge top ($5.97) is made with gold-color lamé of rayon and metallic. Pullover style stars bateau neckline. Side slits. Wear loose or tied with cotton velveteen cord belt. Lounge pants ($7.94) are made with twill back cotton velveteen that styles a full length, tapered line. Waist has elastic tabs that button-adjust for an additional two inches. Description Checkerboard popover features notched boat neckline, button-tab shirt-tail. Multicolor print. Capri pants are tapered and mad with ribbed cotton Bedford cord. Colors are bright coral, antique gold, or black. Description Richly colored pattern of primitive symbols and designs of the Pacific islands... just a touch of gold color added for accent. Printed on smooth Sanforized cotton. 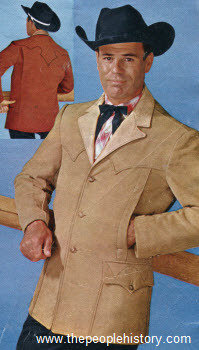 Three-button jacket is fully lined with cotton terry cloth. Two roomy patch pockets. Collar, short sleeves and pocket tops are terry trimmed. Matching boxer trunks have elastic and drawstring at waist. Full knit support. Outside change pocket. Colors are red or blue. Description The skinny look... hip-hugging style, extra-narrow tapered no-cuff legs. No-pleat front, extended beltless waistband, inside adjustable tabs. New texture, husky tight-weave cotton. Colors are black, tan and loden green. Description Natural mink-collared coat... a new silhouette in wool plush with "wedding band" collar. Note fashionable low-set wrist-length sleeves. Milium insulated lining. Choose from black with white mink, beige with dark brown ranch mink or spice brown with dark brown ranch mink. Description Adjusts to fit and flatter all torso lengths. Completely separate strapless bra, attached to inside front of garment, has removable spiral steel stays... uplifts, separates and adjusts to different cup sizes. Tummy control panel. Elasticized bengaline of acetate, cotton and rubber. Colors are larkspur blue, peach blossom, white, black, daffodil yellow, carnation pink or surf green. Description All-cotton overplaid. Rich desert hues of tan and russet, lightly colored with olive and blue and offered up in crisp, fine one-hundred percent combed cotton. Calculated to keep you dry and comfortable, heat and humidity notwithstanding. Three buttons, hacking flap pockets, and center vent. Flip-out chest pocket lining matches gold color rayon coat lining. Description Overskirt fashion, a dramatically scissor-slashed dress widely belted with cotton sateen. In back: long zipper, kick pleat. Handsome brocade of two-ply combed cotton. Colors are lime green or bright turquoise blue. Description It's eye-opener chic for shut-eye hours with the skimmer. Shift lines fall into color panels of leaf green, apricot and maize. Front wears a large pouch-like pocket. Description Misses' dress with back zipper. Made with twill-back cotton velveteen. Comes in red or peacock blue. 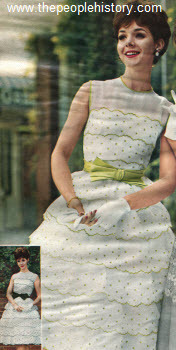 Description Tiers of ruffles, embroidered with dots and scallops, concoct a delectable bouffant. Made with cotton organdy with a back zipper, fully lined. Colors are white with chartreuse or white with black. Description Sleeveless column with that young, young American zest. A slim dress of rayon that looks like linen; elasticized waistline and double string belt add shapeliness. Appliqued with patches in bonfire colors. Long back zipper. Description Intriguing variation of the striped theme. Expressed in muted tones. Painstaking detailing matches stripes perfectly at mitered corners. Continental collar and open neckline give a relaxed casual appearance. Pullover style with hidden loop neck closure. Vented sides. Description The suburban shirt... a unique design with a lovely, leisurely look. The cut is generous, comfortable... the lines simple, relaxed... the details, understated: slotted cardigan neckline, nonchalant roll sleeves and side-curved hem. Comes in lime green, tan or multicolor print. Description Warm quilt-lined coat of finest New Zealand leather, Quilon treated to repel water, Quilon treated to repel water, non-oily stains. Lined with acetate quilted over rayon. Bi-swing pleated back. Smooth leather collar. Leather buttons. Colors are tan or rust. Description Coat and trousers loomed of luxurious two-ply virgin wool tropical worsted. Coat has rayon satin shawl collar, flap pockets, rayon lining, center vent. Pleated trousers have rayon satin braid trim, suspender buttons. Description The Jac shirt brimming with fashion and flattery. Notice the curved gaucho collar, v-neckline, roll sleeves and side vents. Fashioned in newly-popular cotton hopsacking. 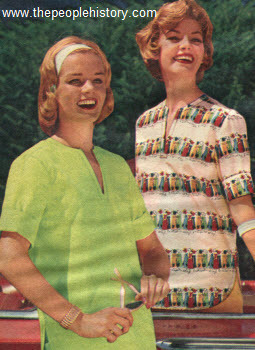 This gay, young sport shirt looks equally becoming with or without the brilliant flapper embroidery. Colors are natural beige, turquoise blue, raspberry pink, or lime green. Description Midnight black with gold-color metallic trim. Knit sleeveless, scoop-neck overblouse. Double-knit three-quarter sleeve jacket and slim, side-zipped skirt with cotton seat lining for shape retention. Description Tunic ($4.97) styled in a courtly manner with rope belt and pompon trim. Colors are blue and white or black and white. Capri pants ($3.97) are tapered for a long, slender look. Have full cotton lining. Colors are blue or black. Description Soft tweed plaid of fine wool... collared in cape fashion, double-breasted and patch-pocketed. Lined jacket; straight skirt, seat-lined to sit well, has back pleat for walking ease. Comes in citron green, tan and beige or medium blue, tan and beige. Description Zig-Zag mates... makes the most of bright tri-colors and tassels. Two pieces in crisp cotton sharkskin, smoothly surfaced. Pullover with bold zig-zag yoke. Cabin boy pants have leg vents, cut-out and tie front. Comes in white with lemon, orange and lime.